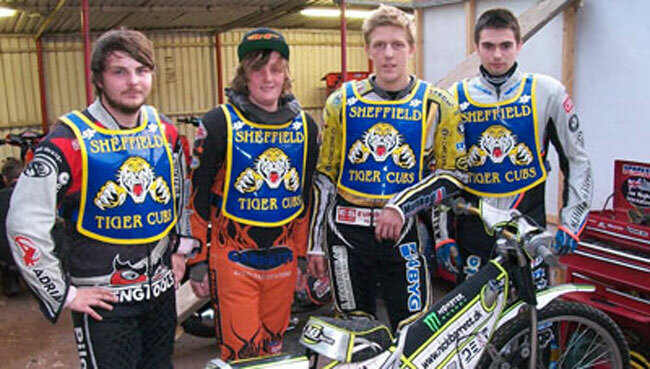 To say none of the Tiger Cubs had ever seen the Belle Vue track before, their efforts left much to be very pleased about. The stand-out performance was from Alex Wilson who, after taking his first ride to become familiar with the circuit, then produced a spectacular ride in Heat 4 in what was one of the best races seen at any level recently. With Rob Shuttleworth away in front for the Colts Alex and Andy Mellish were involved in a tremendous battle for second place with passing and re-passing literally at every corner for all four laps before Alex just held on in the dash to the chequered flag. Alex showed great courage and determination and continues to impress everywhere he goes. He was unlucky next time out when his steel shoe came loose on the first lap and was dangling from his foot hampering his entry into the turns, and for his final outing fatigue was taking effect as Alex completed three races in succession. Dan Miles continued on his steep learning curve and was noticeably getting faster and more confident with each ride and was rewarded with a points haul of 2+1. New boys Sam Darroch and Tom Bacon rode better than their scores suggest. Sam was on the pace and also got faster with each outing whilst the unlucky Tom lost the back end going into the third turn of his first ride and although the resulting slide off seemed innocuous he had tweaked his knee which forced him to miss the next race while he was being checked over by the medics. For the Colts Rob Shuttleworth raced to an impeccable four-race paid maximum and would have been joined by Michael Neale had he not fallen whilst leading his third ride. For me, this meeting summed up the benefits of the Midland Development League in that the real difference between the two sides was a years worth of racing experience, with the Colts being where our young Cubs hope to be this time next year, and they showed plently tonight to indicate they will do just that.